Watch Dogs 2: It’s Just a Game, Right? Blacking out a city block with a tap of your phone. Downloading government secrets with a few seconds of frantic typing. Hacking into a vehicle’s electronics and controlling it like an RC car, all from the safety of a park bench. In Watch Dogs 2, the hacker hijinks you get up to often seem fantastical, almost magical. In effect, that’s exactly what they are: your abilities are powered by an energy meter that functions as a mana bar, and like any RPG worth its salt, you upgrade them over the course of the game, innate powers evolving as your experience grows. Take away the technical jargon and the parallels are even clearer: remote control is psychic possession, activating objects at a distance is telekinesis, overloading electrical systems is effectively chain lightning. The differences are merely cosmetic. From a gameplay perspective, the archetyping makes sense. The technological trappings make the abilities feel fresh, even as their familiar behavior ensures you can start unleashing from the get-go, without wading through dense tutorials or hundred-page wikis to figure it all out. From a thematic perspective, though, equating technology with magic is troubling. 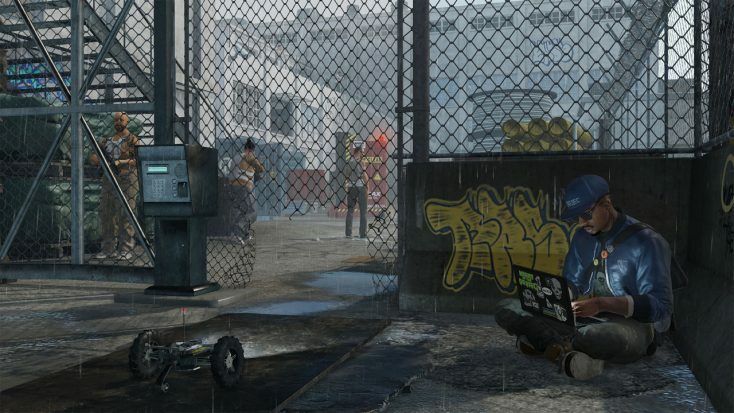 The world of Watch Dogs wants to challenge the wisdom of a fully-connected, data-driven society. It wants us to think seriously about the surveillance-state future we’re rapidly heading towards. By codifying its technological threats in the same language as magic or superpowers, however, it undermines the legitimacy of its message, casting reality as fantasy and dismissing real dangers as mere MacGuffins of its digital world. The problem is, of course, that the dangers depicted in Watch Dogs are very much plausible. We should all be thinking seriously about the consequences of privacy on social media and the myriad ways our own information can be turned against us. But because Watch Dogs is a game, it suffers under the many expectations that term carries. Its open world bends itself to the player’s whim, more concerned with being a playful sandbox than a living, breathing world. As you single-handedly gun down entire gangs and teleport instantly from one side of San Francisco to the other, the pretense of plausibility crumbles, replaced by the clockwork chaos of a Rube Goldberg machine. Sure, hacking into people’s bank accounts and placing false arrest warrants on strangers in the street is all fun and games–except it’s not. It’s happening already, and we should be concerned about getting caught in the crossfire. But when we see it in Watch Dogs, surrounded by typical video game tropes like regenerating health and amnesic enemies, it all too easy to dismiss it as science fiction, instead of just plain science. Herein lies the heart of the problem: for so long, games have been perceived as escapism, fantasy worlds in which to distract ourselves from the troubles of real life. While the likes of Gone Home, Life is Strange and That Dragon, Cancer have shown how games can be mirrors to our world as much as windows into other ones, the stigma of ‘it’s just a game’ persists, and it will continue to do so while the likes of Watch Dogs and The Division blunt their incisive messages with fetch quests and upgrade trees and other reminders of their fictitious nature. A great game and a great story are not peanut butter and chocolate; smoosh them together, and you’re left with a whole that’s less than the sum of its parts.